Bolton is one of the biggest towns in the country and it was once at the heart of the Industrial Revolution thanks to the strength of its cotton industry. Now, it seems that Bolton’s biggest export is celebrities - Peter Kay, Vernon Kay, Sara Cox, Johnny Ball (Zoe Ball’s dad) and Stu Francis all came from Bolton, as you may have guessed from their rather lovely accents. The people of Bolton are welcoming and friendly, and the town has benefitted greatly from investment in developments at Bolton One (a health and sports centre) and The Market Place shopping centre. Nearby are the West Pennine Moors and Jumbles Reservoir and there are plenty of green spaces and parks within the town itself (notably Queen’s Park). We have two storage facilities in Bolton. Safestore Bolton is on Manchester Road just off St Peter’s Way (A666), close to the Royal Bolton Hospital and offers 24-hour access and onsite car parking; Safestore Bolton North is on the B6206 just north of the centre off the Blackburn Road and has offices to let as well as secure storage space. 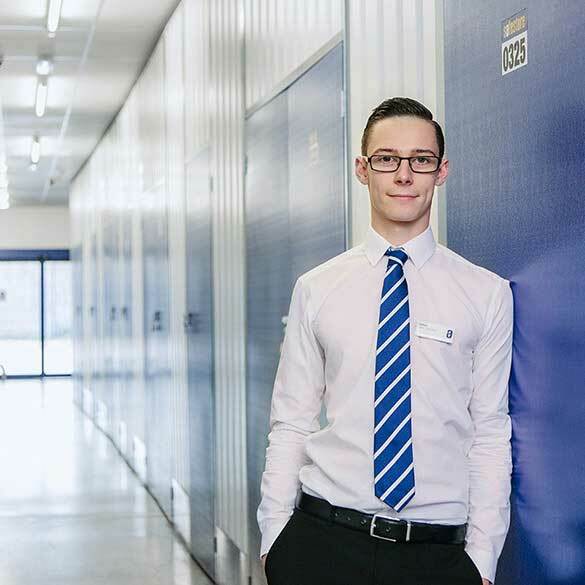 Our Bolton stores are convenient for customers searching for self storage in Leigh, Wigan, Chorley, Blackburn and Darwen, and we’re close to the University of Bolton so we’re ideal for student storage over the holidays. For secure self storage at a low weekly price with flexible terms, call your closest Safestore in Bolton and speak to our friendly team about reserving a storage unit of any size. Or click to book online today - there’s no deposit to pay. Get a storage quote today and reserve a Bolton storage unit for free. We won't ask for a security deposit either. Get 20% off if you need self storage for longer than 12 months. Available at all Bolton Safestore centres. Terms apply. Bolton has a great range of shops, places to eat and a strong sense of history and heritage as well as a passion for sport making it one of the best destinations in the North West for shopping and entertainment. If you live, study or work in the Bolton area and are looking for storage facilities, you’ve come to the right place. We have a team of friendly advisers that can help you with everything storage-related. From the room size you might need, to a quote for your storage requirements, there isn’t anything that our team can’t advise you on. So whether you need somewhere to store your furniture until you move into a bigger place, or you're in the middle of renovations, Safestore has the perfect solution for you. We have a friendly team of advisers ready and waiting to help you with any storage query. A thriving town on the beautiful south coast of England, Bournemouth has excellent transport connections as well as a small airport. Famous for its sandy Bolton, in North West England, is a former mill town with a wool and cotton-weaving tradition and attracts visitors to its shopping centres, markets, public houses, restaurants and cafes in the town centre in addition to retail parks and leisure facilities close to the town centre and in the surrounding towns and suburbs. If you’re in Bolton and looking for extra storage space, whether you need a place to store your sports equipment indefinitely or somewhere to store your furniture while you move house, you’ll find exactly what you need with Safestore. We have years of knowledge and experience in storage, which is why we are the UK’s No. 1 for choice. So if you have any questions or would just like a quote, please don’t hesitate to get in touch. Bolton is renowned for being a friendly place and our professional advisors in store and on the phone embody just that. Our Bolton based advisors are experts in their field and can help you every step of the way through your storage journey. Safestore, in Bolton and beyond, are proud to have been awarded a ‘Gold Trusted Merchant’ award in 2014, 2015, 2016 and 2017 by Feefo (an independant customer tracking system for businesses), commending our ability and commitment to making customers happy.